(Bloomberg) -- The European Central Bank’s chief economist has just shown how determined his colleagues are not to flinch over Italy. Peter Praet’s message to investors on Wednesday to be ready for a pivotal discussion on quantitative easing on June 14 underlines how officials led by President Mario Draghi are keen to appear unfazed at the political crisis in the region’s third-biggest economy. Within two weeks, the ECB went from watching investors fret over the return of euro zone turmoil to arriving at the cusp of winding down bond buying. The accession of a populist government, accompanied by a market reaction that pushed yields to the highest level in four years, even gave policy makers an added incentive to press on with normalization about which they have so far been unrushed. The danger that Italian politicians could plunge the region back into turmoil provides encouragement to the ECB to act before economic conditions deteriorate further. -- Stephanie Flanders, Bloomberg Economics Senior Executive Editor. Read more here. Prime minister Giuseppe Conte, a political novice, has promised to cut taxes, lower the retirement age and expand benefits for the poor, setting his spending plans on a collision course with European partners. While Italian bonds and stocks dropped on Wednesday after a week of wild swings, the rest of the region seemed relatively unscathed and Praet reaffirmed his confidence in the “underlying strength” of the region’s economy. That optimism, together with an inflation outlook that shows signs of “progress,” should be enough to keep the central bank on track to stop buying bonds this year, with policy makers set to hold their first formal round of talks on the issue on June 14 in Riga. The stance wrong-footed some investors and economists who had been expecting an announcement in July, and possibly even an extension of QE into 2019 to counter political turmoil. For Italy’s new populist government, it dashed speculation that the ECB quantitative-easing program will shield it from investors’ skepticism. ECB policy makers often repeat that their decisions are only aimed at fulfilling their mandate to secure price stability in the euro area. Yet their actions are already being scrutinized for their political implications in Italy. Deputy prime minister Luigi Di Maio, leader of the anti-establishment Five Star movement, said rising yields on the country’s debt were partly a consequence of the central bank’s reduced buying. When data on Monday showed that purchases of Italian bonds had actually fallen in May, the ECB took the unusual step of explaining that this was a consequence of its complex reinvestment policy. The prospect of an ECB commitment to end purchases this year does threaten to further pull the rug out from underneath Italian bonds. Two-year yields have climbed 110 basis points since the end of April, while credit default swaps insuring Italian debt are near the five-year high reached last week. Italian securities are among the biggest beneficiaries from the bank’s 2.6 trillion-euro ($2.7 trillion) asset-purchase program. 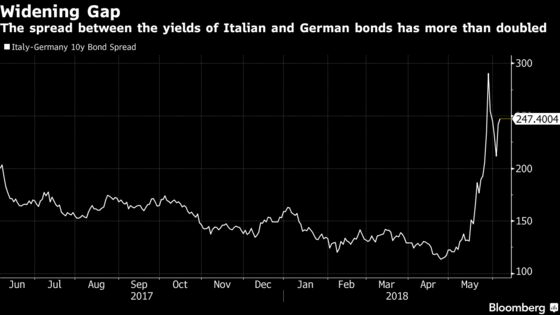 With liquidity already showing signs of drying up, Italian government bonds will need to find some fresh buyers, according to Commerzbank AG. The more pressing question for the ECB is whether tension in Italy has had an impact on the region’s economic sentiment. The euro zone’s momentum has lost steam amid mounting concerns over trade tensions with the U.S., but policy makers have dismissed recent data as a mere adjustment of the pace of growth to more sustainable levels. Moreover, crisis-fighting measures have reduced the risk of contagion.